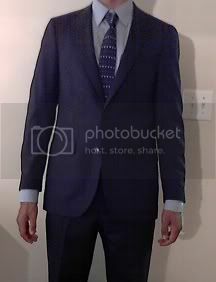 I just purchased this Land's End Tailored Fit Suit a while back when they ran a 25% off special. Generally speaking, I really just don't like the jacket. I KNOW the sleeves are too short. I generally get a 38L because of the sleeve length, but they only had 38R so I got that with the understanding that I would get the sleeves done. Overall, however, it just feels too boxy and wide for me (even though it's the tailored fit; I'm a fairly trim guy). The arms are a little wide as well, but I'm not too concerned about that. I'll just hit the gym! Haha. I think it looks a lot better when it's open (and I'm in movement). Otherwise, how does it fit? Do the shoulders look fine (I think they do). What about the chest (I think it fits, though a tad bit too big. Maybe I'm closer to a 37 or 36 but then the shoulders would be too small on most jackets). My main concern is the length of the body of the jacket. I actually really like it. 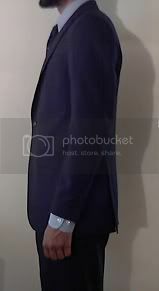 It's a tad bit shorter than the prescribed length (where the bottom of the jacket rests in your cuffed hands), but I have abnormally long arms, and by using that standard, I feel a jacket will look too long on me. What do you guys think? Is the length of the body ok? Should I just return it or would it be worth trying to take in the waist and lengthen the arms? The jacket seems like it needs to be taken in at the waist a bunch. Also, there is probably a lot of extra material under the arms keeping the jacket off of your chest and making you look bigger. 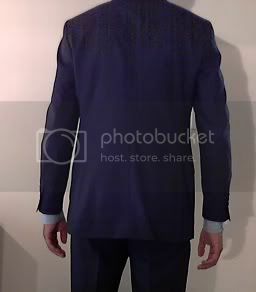 Im far from a pro when it comes to tailoring, so im not sure if just bringing in the waist will fix that or not, or if my second point is actually the case. I would wait for more responses. All around the suit is currently making you look much bigger than I think (and you said) you are. Jacket definitely looks like it could be taken in, and what's with the wrinkling in the sleeves in the first two pics? You said they're a little wide, but they almost look too narrow. Not picking on you at all, but for the purposes of getting a satisfactory answer, you really have to do that. From my very amateur viewpoint, I believe what you've got is a workable suit jacket in need of tailoring. 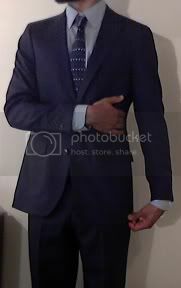 I agree with what @nicholas said about taking better pics with your arms at your sides, but I think the shoulders are a bit big on it and it's definitely boxy through the body. Also, are you sure there's enough material to let the sleeves out? Looks like they need about an inch and a half. "The same jacket sleeve before (left) and after (right) it was rotated to conform with the wearer's natural arm position. Sleeves should hang straight with no horizontal wrinkles appearing on the upper arm; if they show creases then they are not aligned with the wearer’s hanging arm – this can be corrected by having the sleevehead rotated clockwise or counter-clockwise accordingly (if the store tailor says this is not possible it actually means it is not preferable to invest the time needed for such a major alteration)." If you're talking about the dimpling towards the forearm, then that's caused by the shirt under the jacket. It has sleeves like a flying squirrel so in relation to the shirt, the sleeves of the jacket are too narrow. It was just the first shirt I came to in the closet. In the other pics you can see that the shirt arm is too wide (look at my wrist). I have to have my shirt sleeves taken in cause I'm kinda skinny. New pics coming in about 5 minutes. Definitely could be taken in on the sides and you already mentioned the sleeve issue. Is their any collar roll as well? 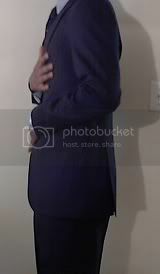 Note: The pic of me pressing against my chest/abdomen, and clutching the side of my waist are to illustrate just how much room I have in there....I'm not as wide as the suit makes me look. Also note that the seam where the body meets the sleeve sits right on the bone in my shoulder.